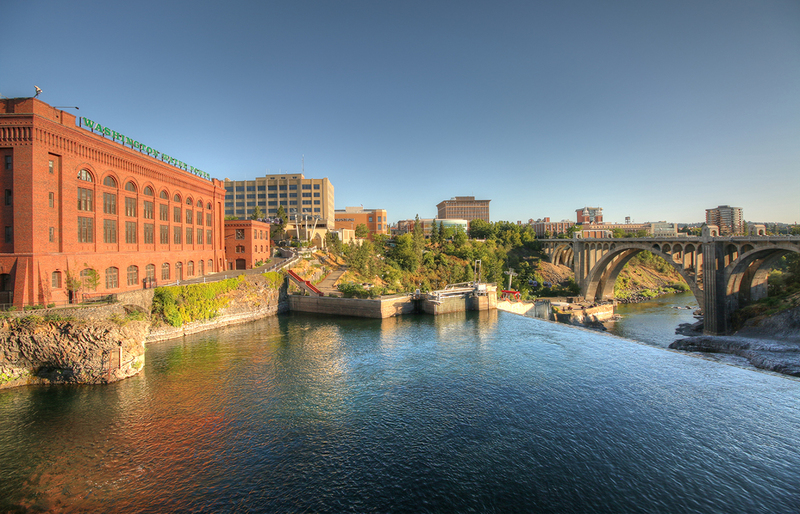 Welcome to Go Spokane Real Estate where you will find up to date information on the Spokane real estate market. 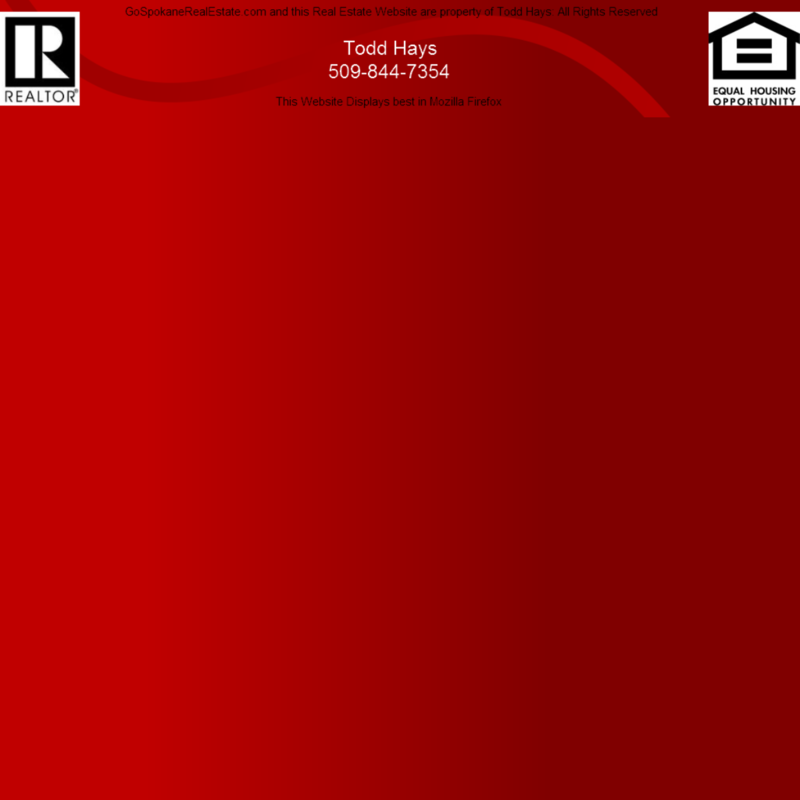 Here you will find valuable resources whether you are looking to sell your home or buy a home in the Spokane area. If you are looking at homes for sale in Spokane or the surrounding area, you can search the Spokane MLS. You can use your own custom search criteria or the home search map feature. I teach a home buyer education class in Spokane where you can learn more about the home buying process including home mortgage and many different home loan programs available. If you own a Spokane home that you are considering selling, you will find information to help decide if now the right time to sell. Here you will see the latest statistics regarding the Spokane real estate market. There is also information that will help you price your home correctly and understand the importance of a good marketing plan. There were 459 single family homes on less than one acre including condominiums sold in Spokane County in March this year. This number is down 24.4% from the same time last year when there were 607 homes sold. This decrease in sales volume is largely due to a lack of inventory. 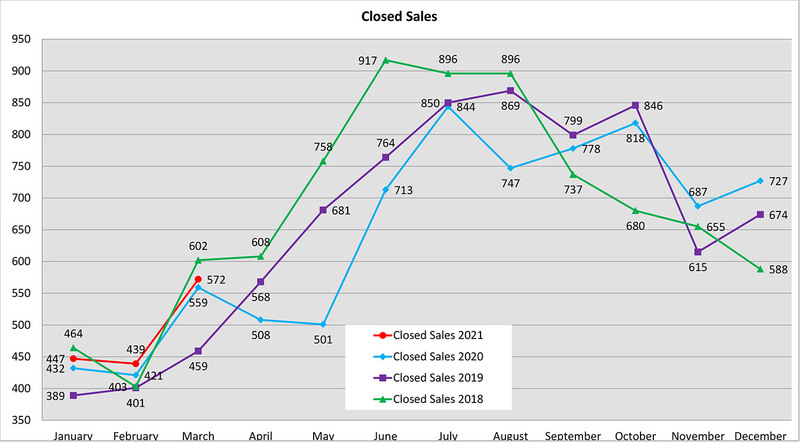 Year to date sales through March there were 1,226 closed sales compared to 1,476 closed sales by this time last year. Sales are down 16.9% for the first quarter of 2019. The average home sales price for March in Spokane County was $270,190. 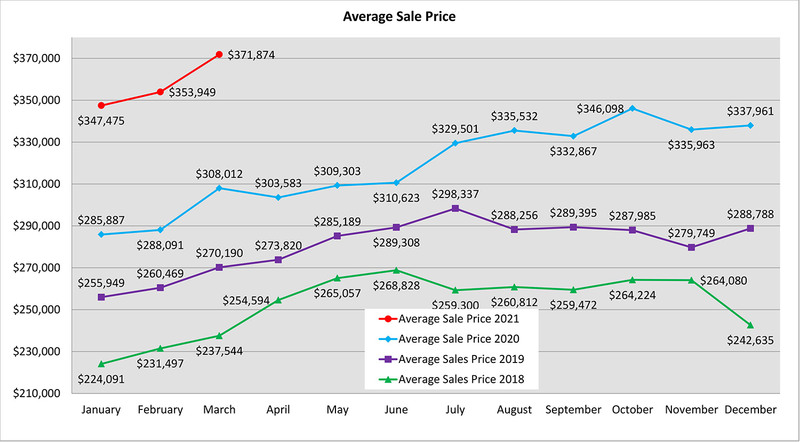 Not only is this up 14.1% from the average sales price for March last year but it is also the highest average sale price for any month ever in Spokane. 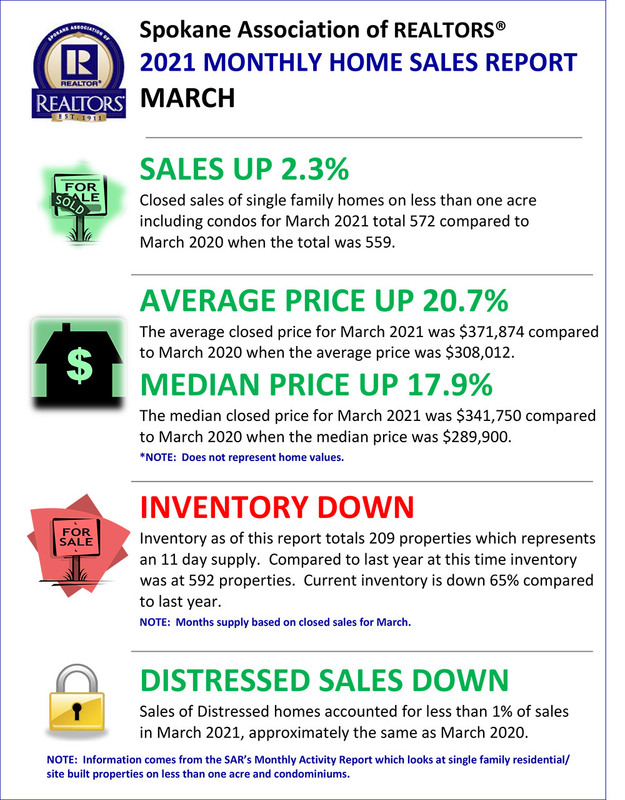 The year to date average sales price through March is $262,673. This is up 13.5% from the average over the same time last year, which was $231,478. 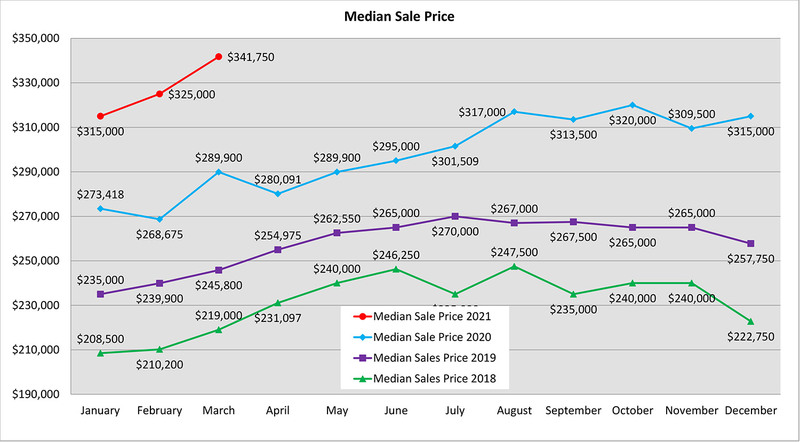 The median sales price for this March was $245,800 which is up 12.2% over March of last year with median price of $219,000. The year to date median sales price is also up; 11.6%. $240,000 was the year to date this year compared to $215,000 last year. Down 12.2%, Spokane housing inventory continues to be very low. As of this report, there were 894 properties compared to 1,018 properties the same time last year. New construction sales in March totaled 43 compared to 81 last year. Year to date new construction closed sales are down 11.5% with 154 so far this year compared to 174 through March of last year. Spokane home byers looking at homes in the median price range are going to find the market quite competitive. Homes get bought very quickly, often times with multiple offers. Even when they go under contract it is not uncommon to see a backup offer. Where have all the good deals gone? You are not as likely to find desperate sellers willing to except lowball offers and sell their homes below market value like was the case just a few years ago but there are still good values out there. They just don't stick around for long. When you look at the current inventory you see a lot of over priced homes in poor condition. You look at a dozen or so overpriced homes the first weekend out and become frustrated. Then on Tuesday a home comes on the market that you may be interested in. You look at it on Wednesday and that evening it is already under contract. This happens another time or two before you move on something more quickly and get an offer in. You may need to put offers in on three or four before something is accepted. Even then they may have a backup offer so you can't get too crazy with the inspection contingency. Meanwhile, most of those first dozen homes you looked at are still on the market. Bottom line, more than 80% of what is on the market is overpriced. OK, at least half of what comes on the market is priced correctly so why is 80% of the inventory at any given time overpriced? The homes that are priced correctly sell quickly but the overpriced ones stay on the market a long time affecting this statistic. How is the best way to approach this market? Get pre-approved by a lender and know your price range. Make a list of needs and wants with an emphasis on needs so you don't make a purchase you later regret. Know your market and look at new listings as soon as they come on the market. Be ready to write strong offers and wright them quickly. Right now is the best time to have your home on the market in over a decade if you're a trying to sell a home in the Spokane area. If your home is on the market right now and has been on the market for more than a month, then read on. 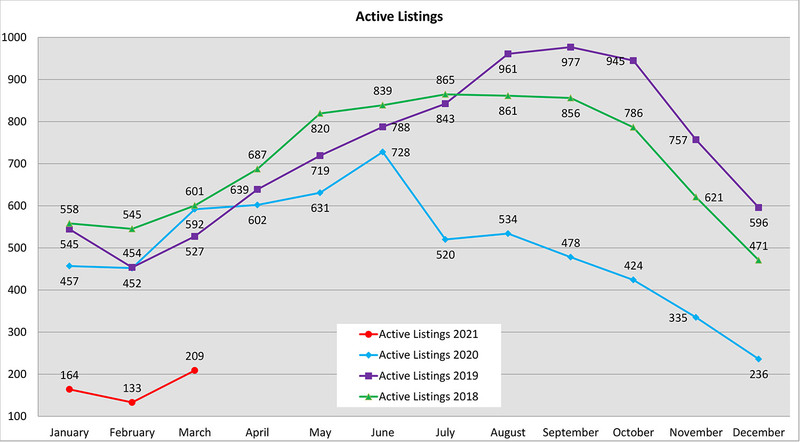 If you have a home in the Spokane area and you are thinking about selling it, this is a great time to put it on the market, read on. When you first put your house on the market is when you get the most interest. Not only that, these are your best buyers. These are the buyers that have already been looking at houses in your neighborhood in the same price range as yours. They are actively searching and as soon as your house comes on the market they notice it right away and arrange to see it. You may get six or more showings and multiple offers the first weekend your home is on the market. You may also get quite a few showings and no offers or an offer below your asking price. When you are getting so much activity it seems pretty early in the game to be thinking about lowering your price, or considering an offer lower than your asking price. As I discussed earlier, the initial activity is from buyers that have already been looking; many for months and many even longer. They have seen good values come on the market and get sold very quickly. Many of them have written offers but gotten beat out. These are active, motivated and educated buyers. They are motivated but not desperate. If they wanted to pay too much for an overpriced home, there are many to choose from. They know more about the real estate market in your neighborhood than you do. The second week that your house is on the market you can expect to get about half as many showings as you did the first week. The third week you will get half of the second and then they will trickle in at a rate of one or two a week. To make matters worse, those one or two a week showings are not the same active, motivated, educated buyers that we were talking about. They will be some day but not now. They are new to the market; they are on the learning curve. Here is what you need to take from this: Get your house completely ready to put on the market before it goes on the market. Price your home correctly when it initially goes on the market. If your home gets a lot of initial interest but no offers consider reacting with a price reduction sooner than later.